We have a true passion for Crossfit. I am a married father of three and life-long Lemoore resident. I played football and baseball all through high school and into junior college. Once out of school, I stopped playing sports and didn’t workout because I hated being in the gym. After many years of being out of shape, I decided to try CrossFit. I was instantly hooked. CrossFit satisfied my competitive streak and helped me to get healthy and fit again. But, the best thing about CrossFit was the community of people that it brought me in contact with. The CrossFit community is what makes CrossFit so unique and special. In August 2012 I obtained my Level 1 Trainer Certification and began coaching at CrossFit Visalia, but I saw a need in Lemoore. I felt compelled to share CrossFit with the people in my hometown. The staff at CrossFit Lemoore is dedicated to making a difference in people’s lives through fitness. It is my mission, as owner, to provide an environment that is welcoming to anyone regardless of age or fitness level. I want to help every person who walks through our doors, whether you are an elite athlete or you are someone who is just trying to get healthy. Raised in Spring Mills, Pennsylvania, Pat Tuman enlisted in the Army right after high school at the age of 17. Her background in the military combined with her career in law enforcement have always inspired her to maintain a certain level of physical readiness, and for years that looked like lifting weights and doing cardio at local gyms. Pat was familiar with CrossFit, but had no idea there was a box in Lemoore. That all changed when a Facebook friend shared a post that tagged CrossFit Lemoore. Two weeks later, in July of 2013, Pat walked through CFL’s doors and never looked back. In June of 2017 she completed her Level 1 Trainer certification, and has since obtained numerous others. Pat appreciates CrossFit for it’s adaptability; any workout or movement can be modified, giving the opportunity for each participant to feel the same intensity and sense of accomplishment, regardless of age or physical limitations. As a coach, Pat loves the enthusiasm and drive each different type of athlete brings to the gym’s supportive community. Southern California native Carlos Villagomez found himself in Lemoore after joining the Navy. Growing up he stayed active by playing football, and in high school he enjoyed water polo and competitive swimming. After graduating from high school in Riverside Carlos left for boot camp, and now works in the aviation maintenance field. While he didn’t begin CrossFit until coming to Lemoore, the subject wasn’t new to him. In high school, Carlos passed by a local box every day on his way to campus. He was always interested in trying it out, but didn’t have the courage to walk inside. After being stationed at Lemoore NAS and feeling like he was in a more permanent spot, Carlos finally decided to give it a try. From that very first day, Carlos has loved the community of people CrossFit brought into his life. Being around others who want to better themselves, who will push him to get that very last rep, has been an inspiring connection that he never found in other sports. As a coach, Carlos loves being able to cultivate that same connection for others. Being able to motivate gym members in their journey to fitness and to watch them grow makes him feel like he is making a difference, and he looks forward to growing every day with his fellow gym members. Originally from Springfield, Illinois, coach Tom Robinson has a long history of fitness involvement and leadership. He began weightlifting at the age of 14, and spent his high school years wrestling and playing football. At the age of 18, Tom joined the Navy, and has been living in Lemoore since 2002. During his time in the Navy, Tom was assigned command fitness leader, and tasked with helping his fellow military personnel pass the Navy Physical Readiness Test. After leaving the Navy in 2007, he became a Certified Personal Trainer through the American Counsel of Exercise, and received his AA in Kinesiology from West Hills Community College in 2009. When participating in his first Mud Run led to the discovery that he wasn’t as in as good of shape as he thought, Tom turned to CrossFit. The challenge of trying something new and breaking his old routine of “bodybuilding type workouts” drew him in, and having the opportunity to try to be better at something every day has kept him coming back. In January 2013 he obtained his Level 1 Trainer Certification, and has been a coach here at CrossFit Lemoore ever since. Tom’s favorite part of coaching is seeing athletes accomplish something that a year ago, they would have thought impossible, and it’s this encouragement that keeps him rolling out of bed at 0400 to coach each morning. Kyle stumbled upon CrossFit in January of 2015. Initially, she planned on using it as a short-term kick-start to get back into shape after an injury had limited her physical activity. Kyle surprised herself by falling in love with the community, and has since been a devoted gym member. Throughout high school Kyle played volleyball, but for most of her adolescence, her main focus was rodeo. She put in work each day training and caring for her horses, and spent countless weekends traveling to and from rodeos with her family. This taught her about dedication and hard work early on, helping her grow into who she is today. Kyle loves the morale and second family she’s found at CrossFit Lemoore, as well as the unique challenges that each day’s WOD presents. The Lemoore native is currently working towards her Bachelors of Science in Kinesiology Physical Education at Fresno State, and is set to graduate in spring of 2019. In order to further develop her passion for CrossFit, Kyle obtained her L1 certification in May of 2018. Her favorite part about coaching is watching athletes improve – whether it’s hitting a new PR or stringing together their first few double unders, Kyle enjoys helping people become more functionally fit. Fitness has always been an important part of Fran’s life, and she spent many years working to be the best she could be both in the gym and in the pool. Fran served in the Navy for 10 years, and has called Lemoore home along with her two children for over a decade. While she has always enjoyed working out, she feels that CrossFit has taken her fitness to the next level. 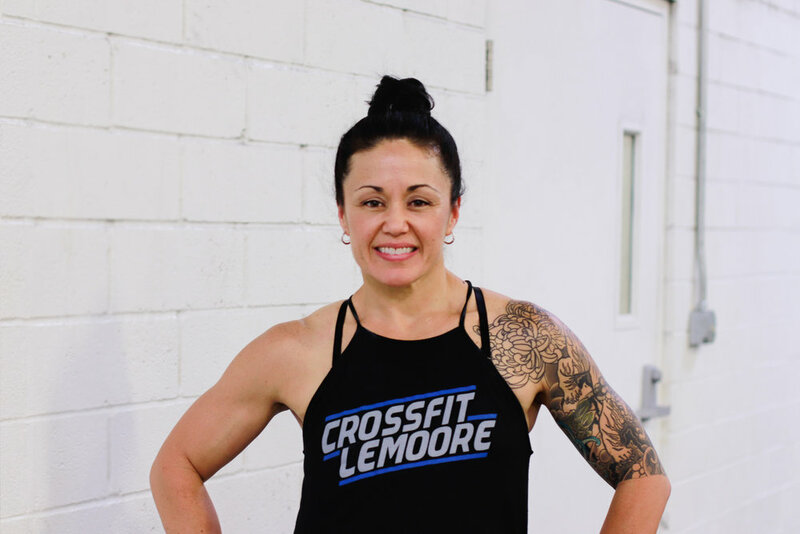 One of her favorite parts of CrossFit is watching the community help people improve their own health and fitness levels, and it is this motivation that pushed her to earn her CrossFit Level 1 Trainer Certification in March of 2013. 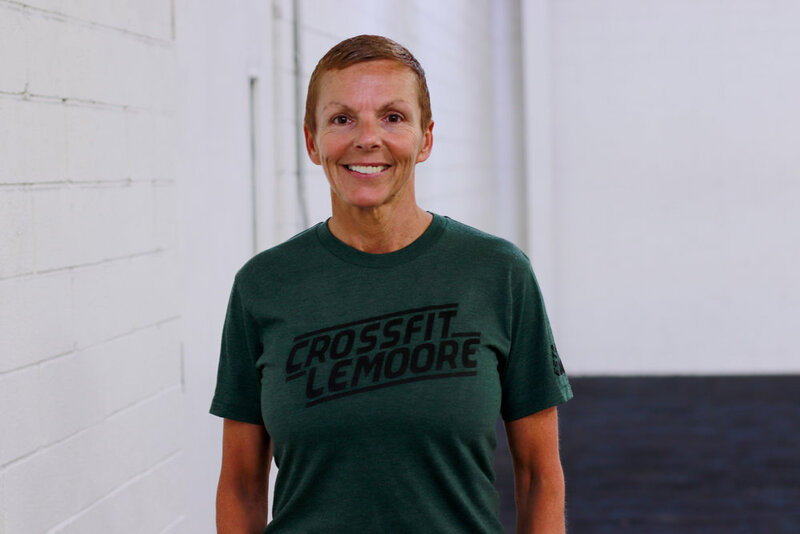 She has been encouraging and inspiring CrossFit Lemoore members to reach their goals ever since. Zach Rogers-Jones first moved to Lemoore as a toddler, and was a proud graduate of Lemoore High School in 2007. A lifetime sports lover, he played soccer until the age of 18, and raced BMX bikes competitively well into his teen years. Like many others, Zack chose to try CrossFit because he got bored with his gym routine. He valued the fact that CrossFit could always keep him guessing with a different workout each day. After receiving his L1 certification in 2014, Zach was able to see the gym from a new perspective. As a coach, Zach loves having the opportunity to affect even a complete stranger’s life, and is humbled by being able to watch the community around him get fit. Sports have been a part of coach Heidi Robinson’s life since she was young. From two-on-two basketball in the driveway with her sisters to playing collegiate volleyball for two years, Heidi’s love for physical activity has always inspired her. Originally from Wichita, Kansas, Heidi found CrossFit when she was at her weakest both physically and mentally. Recently divorced and coming back from a double mastectomy, the CrossFit community gave Heidi people who became some of her best friends, and workouts that were intense and kept her interested. Heidi is now married to one of those people, and credits CrossFit with showing her what it truly means to be strong. Heidi attended Cowley County College in Kansas before transferring to Oklahoma State University where she earned a Bachelors degree in Elementary Education. She went on to earn her Masters in Educational Leadership and Administration from Chapman University, and has now been teaching for 17 years. Heidi loves coaching at CrossFit Lemoore because it allows her to meet new people and cheer members on as they work out and grow together.